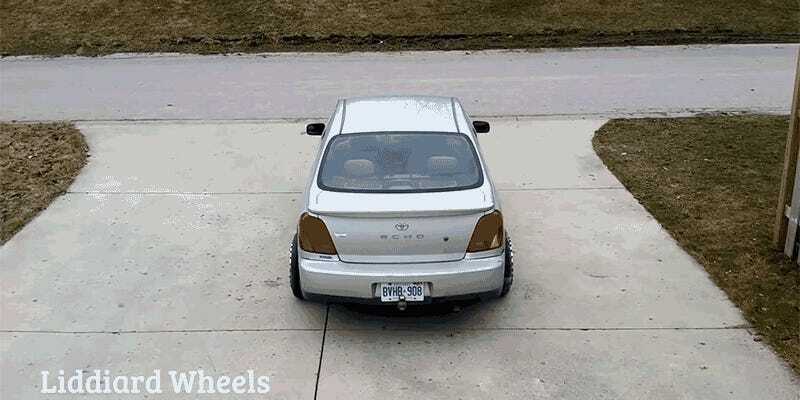 We’ve seen omnidirectional wheels installed on forklifts that have to deftly maneuver around crowded warehouses, but William Liddiard has invented a set that allow his Toyota Echo to move in any direction, spin 360-degrees, and slide into a parking spot making parallel parking easier than actual driving. William calls his creation Liddiard Wheels—appropriately enough—and they’re powered by 24,000 pounds of torque applied directly to the wheels which gives them incredible precision. They can also be bolted onto any vehicle making it easy to upgrade your existing ride, and they’re designed can be used on roads in any weather condition. If you rolled up to your drivers license road test with a set of these on your vehicle, do you think they’d accuse you of cheating?